The serpentine bridge project will incorporate several customizable lighting components. 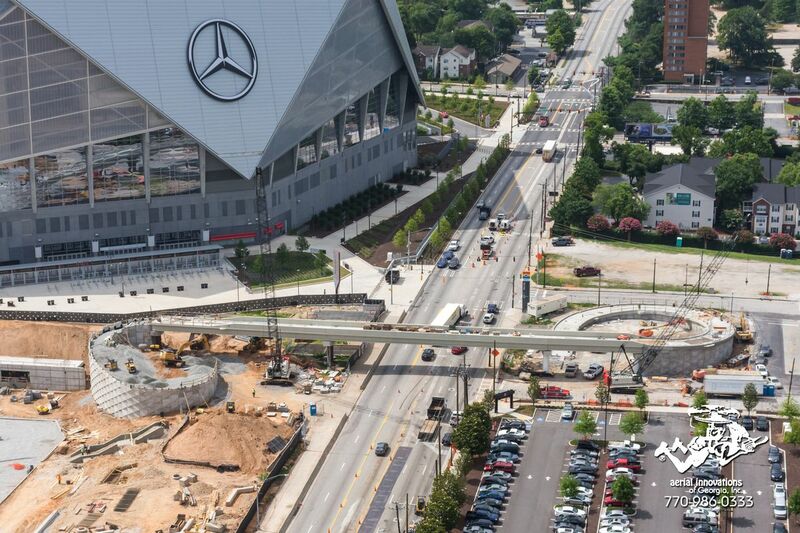 On the northwestern flank of downtown Atlanta’s $1.5 billion Mercedes-Benz Stadium, a pedestrian bridge is taking shape over Northside Drive that project leaders say will be as eye-catching as it is functional. 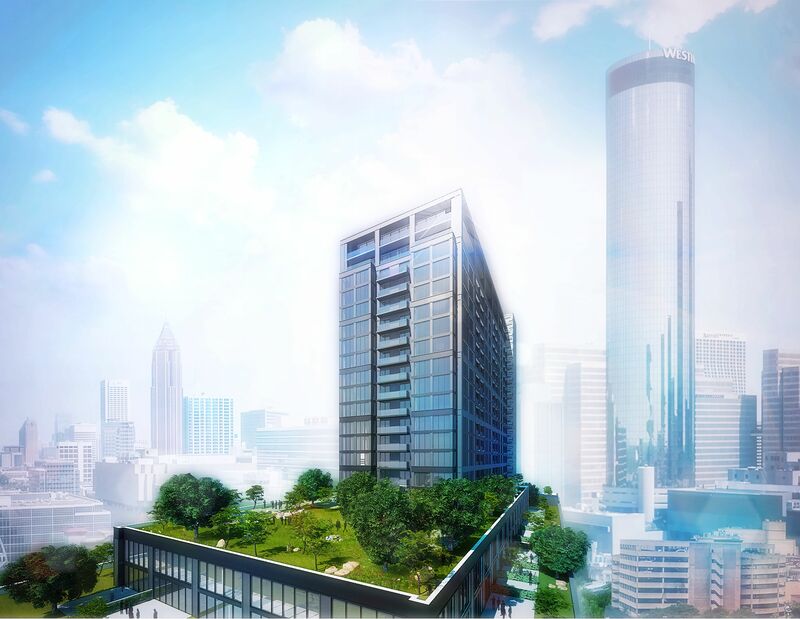 And the whole thing is going to glow, as project heads detailed for Curbed Atlanta this week. 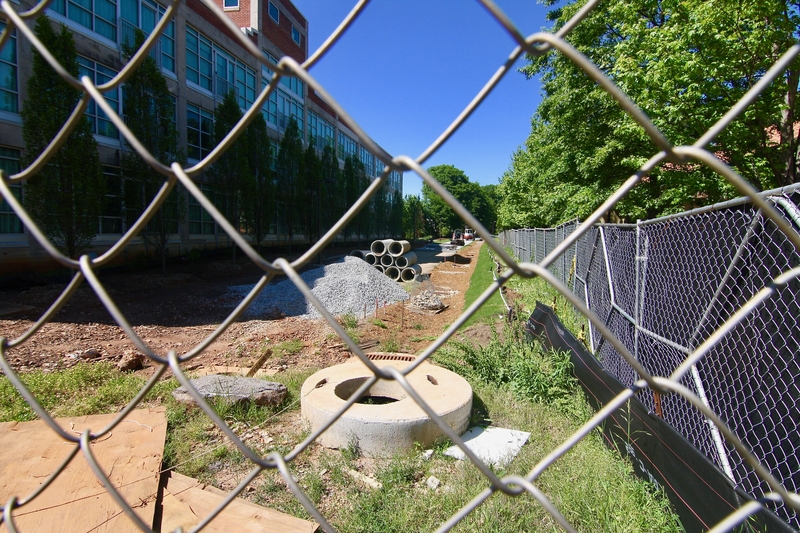 The serpentine, ADA-compliant, city-funded bridge is being designed (and tweaked) alongside work on the adjacent Home Depot Backyard, a green space for tailgating, community events, and park recreation. With sloping curls at each end, the bridge spans five-lane Northside Drive, connecting the new stadium with the Vine City MARTA Station, nearby parking, and westside neighborhoods. 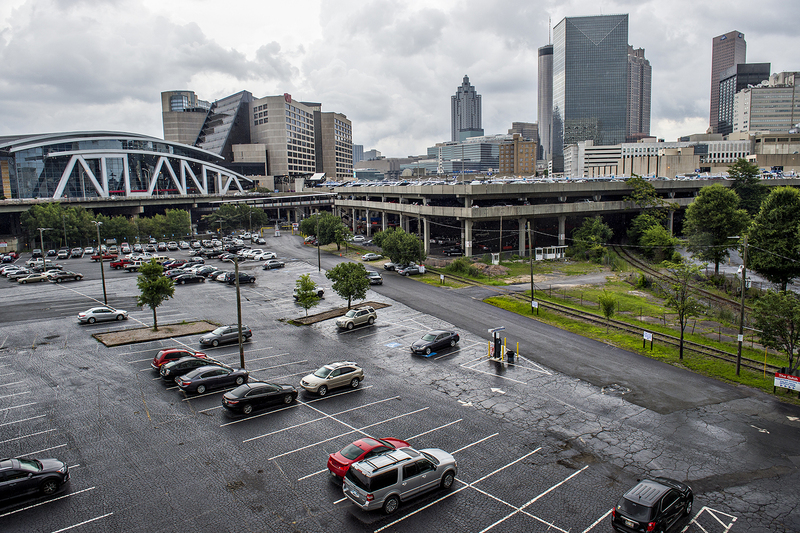 A separate project to include parking improvements at the MARTA station next to the bridge will come later, Vince Press, a rep with CPL, the bridge project’s lead architectural designer, said this week. The bridge project has caught flak for rising taxpayer costs—the latest estimate is $23 million, or nearly double what Mayor Kasim Reed’s administration had predicted in 2016—while others, including Atlanta City Councilmembers, have wondered aloud whether the bridge serves nearby communities such as Vine City or just sports fanatics and tourists. 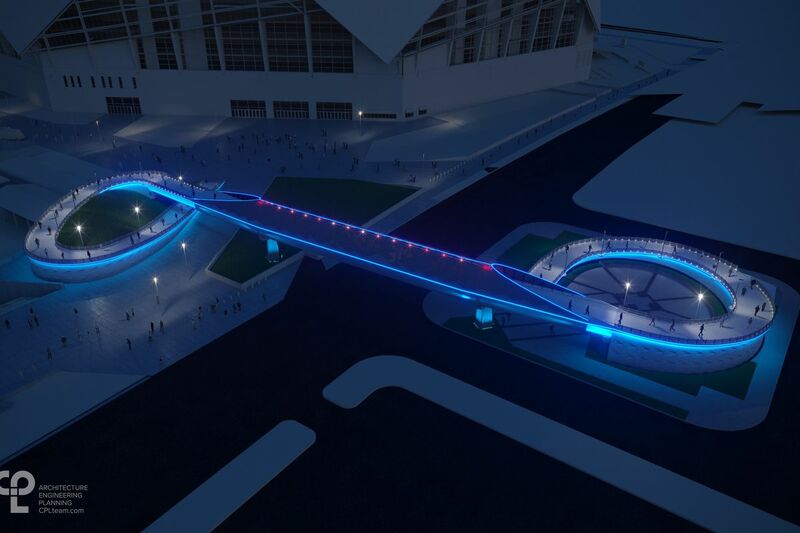 Nonetheless, the bridge will make an architectural statement, and it’s expected to deliver in time for Atlanta’s first Super Bowl in nearly 20 years, come February. 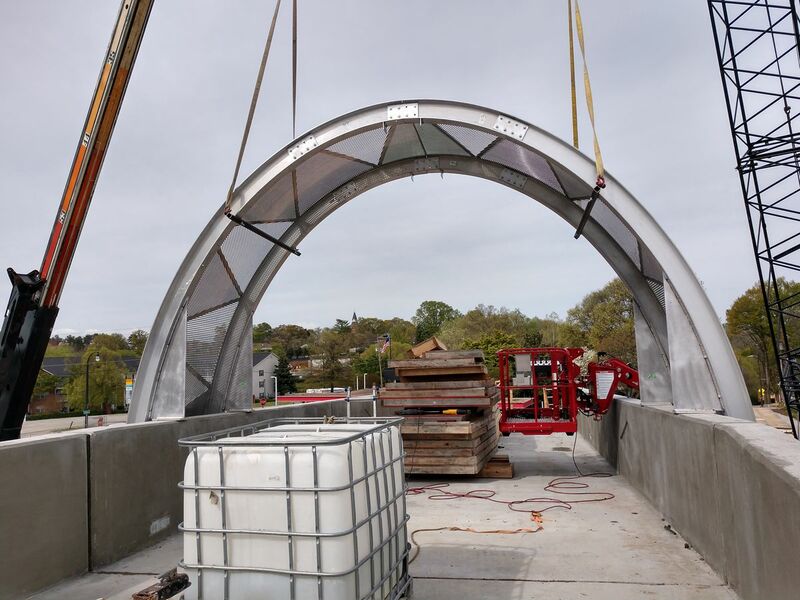 This week, Press provided an update on construction and interesting factoids about the bridge’s composition, from the ramps (made internally of lightweight Styrofoam, to reduce pressure on the MARTA tunnel directly beneath) to the skin. 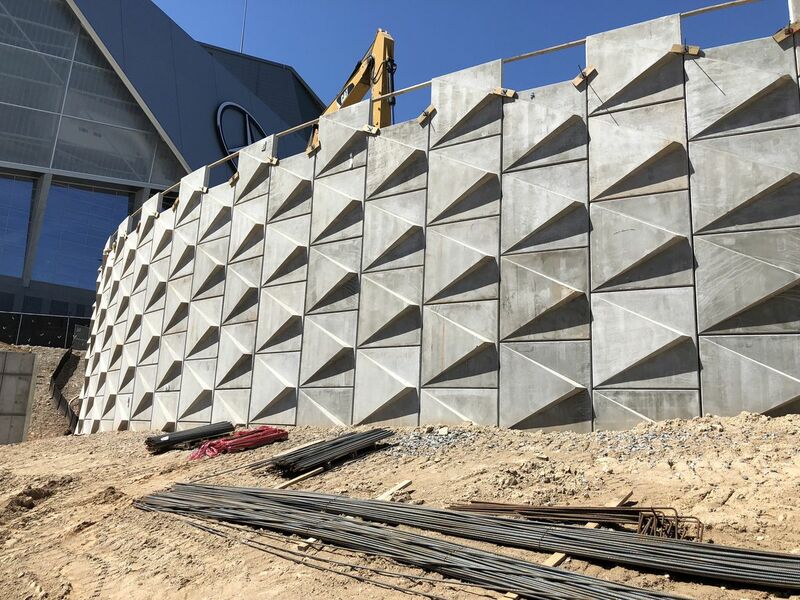 A composition of solid and perforated diamond-shaped aluminum panels, the skin will enclose the bridge spans, which will incorporate several customizable, aesthetic lighting components. Beneath and integral to the roof of the skin, cove lighting will wash the interior ceiling/walls with controllable color LED lights. This light will permeate the metal skin creating an internal glow for the enclosure. The exterior of the bridge enclosure and ramps are encircled with continuous controllable color LED strip-lighting, reinforcing movement along its serpentine form ... The colored LED lighting along the bridge can be customized to highlight events, festivals, and holidays. Throughout the project, find diamond patterns—both prominent and subtle, from concrete parapet walls to the aluminum skin—that reference the stadium’s dramatic angles. Aluminum skin recently being installed for test-fitting. Permanent installation is expected to start in coming weeks. Designs for the bridge’s eastern ramp (below, at left) were changed from initial renderings to create better continuity with the Home Depot Backyard project. Most noticeably, the height of a wall of reinforced earth was adjusted, officials said. Inside the eastern ramp, AstroTurf is being installed on the slope, an effort to “minimize maintenance and provide a unique surface for implementing temporary logos for events, festivals, and holidays,” per the architecture team. On the flip side (above, at right) the project’s western flank is incorporating a paver and concrete plaza, encircled by the ramp to the MARTA Station. Expect seating, plantings, and “appropriate area illumination,” alongside granite from local quarries that’ll be used to form paired obelisks, with lighting and sculptures, near both ramps. 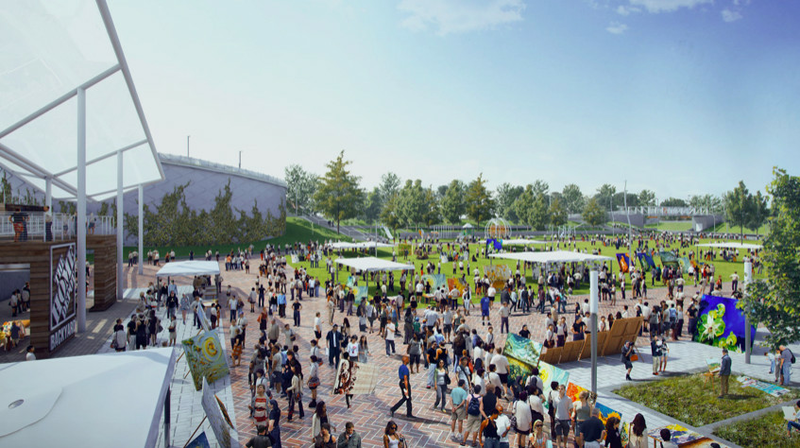 The bridge wall, at left, in the most recent renderings for the Backyard tailgating, park, and events space. Officials estimate the bridge project will finish sometime in the fourth quarter of 2018. 10 best bets for Atlanta spring festivals and events, mapped From street parties to massive multi-day concerts, there’s no shortage of springtime hullabaloo in the ATL. Photos: Beltline’s Eastside Trail is ‘close to completion’ near Memorial Drive You’ll soon be able to travel from Midtown to (almost) Ormewood Park without leaving the Beltline, in theory. At Chastain Park’s cusp, is this stone-built dwelling exquisite enough for $2.9M? Totality of four-bedroom’s design is described as "transitional and fresh"
Priced in $400Ks, latest eastside townhomes praising Beltline proximity launch Edgewood project called "The Row on Wylie" is under construction off Moreland Avenue. 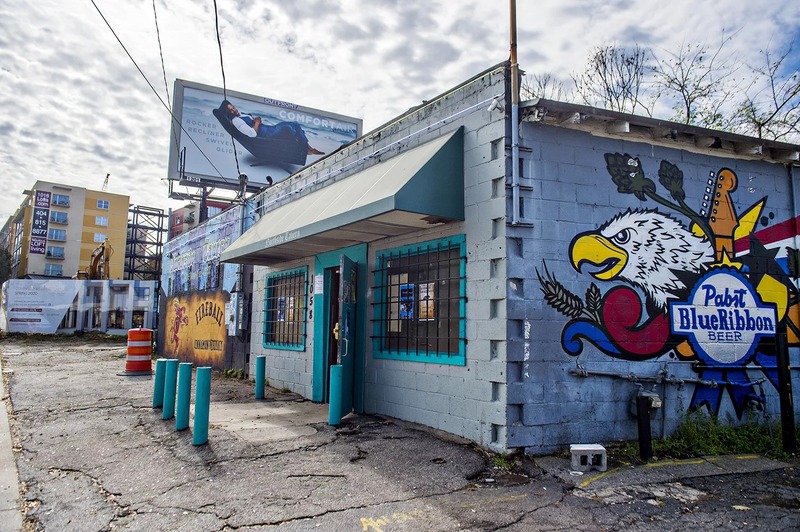 Battle over Blandtown concrete plant fizzles, but legal melee could ensue Neighbors of the proposed West Midtown project say it could increase traffic and be a cancer for the environment. Substantial payment to APS is reportedly more than three months late.